In need of an electrician in Amsterdam? Call us! No matter what kind of problem you have with your electricity, we will help you quickly, efficiently and professionally. Working with electricity can be complicated and even dangerous for someone without the proper knowledge. 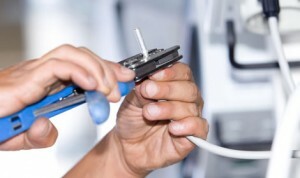 Therefore, it’s always best to find a professional electrician to help you out with jobs like expanding the distribution board, fixing an overloaded circuit, placing extra outlets or rerouting power cables. Looking for an electrician in Amsterdam? We are here to help you out. Our electricians are all extremely skilled and have been working in this industry for many years. There’s no problem we can’t fix! Whether you need us for installation, maintenance or repair: we guarantee you’ll be satisfied with the result. Today, almost everything is dependent on electricity. That’s why it’s important to know who to call in the event of a short circuit or power outage. Our electricians in Amsterdam know how important it is to restore the power as quickly as possible. In and around the city, we will help you day and night. 365 days a year! We’ll do all we can to help. Would you like to know more about our services? Or do you need our help immediately? Please contact us, we’re happy to talk to you.